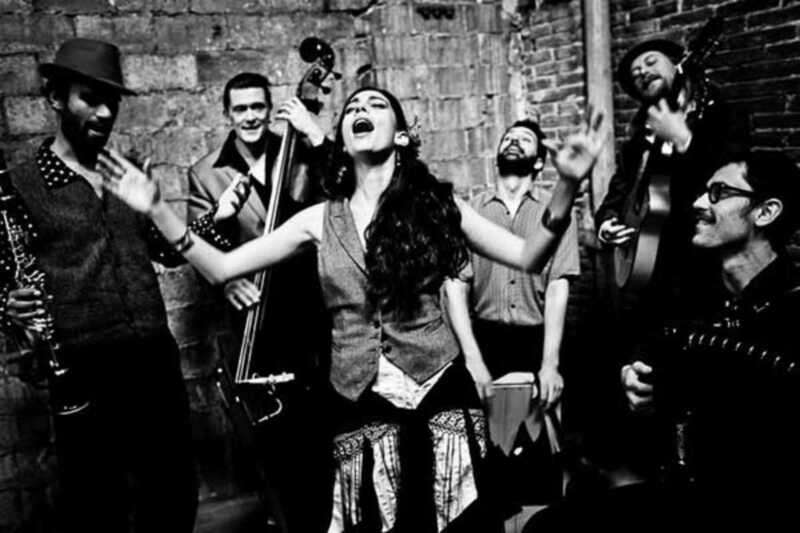 The phenomenally talented Barcelona Gipsy Klezmer Orchestra, who you may have seen at their regular jam sessions at El Arco de la Virgen, bring their Balkan sound to the Apolo. Their music fuses Klezmer, Gypsy jazz and Romani rhythms with influences from other folk styles from Eastern Europe as well as contemporary genres. Joining the full sextet – Robindro Nikolic (clarinet), Ivan Kovacevic (double bass), Mattia Schirosa (accordion), Julien Chanal (guitar), Stelios Togias (percussion) and Sandra Sangiao (voice) – will be the BGKO string section – Oleksandr Sora (violin), Sasha Agranov (cello) and Ivan Ilic (guitar) and guest musicians King Ferus Mustafov (sax) and singers Nihan Devecioglu and Vlado Kreslin. The international ensemble, whose members collectively represent nine countries, embodies the vibrant fusion of the Jewish and Romani musical traditions.